Summary: The description, specs, pricing, photo and user ratings of the Colt Combat Unit Rail Gun pistol. 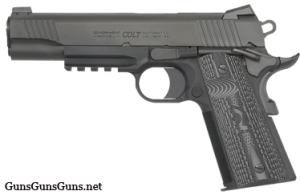 Colt‘s Combat Unit Rail Gun is a full-size, 1911-style pistol built on a stainless steel frame with a stainless steel slide, and chambered in .45 ACP or 9mm. Colt says firearms trainers Ken Hackathorn and Daryl Holland helped design the gun. The Colt Combat Unit Rail Gun from the left. The pistol comes with two stainless steel magazines, a cable lock and an instruction manual. This entry was posted in .45 ACP, $1,251-$1,500, $1,501-$1,750, 1911, 9mm, Colt, Full size, Semiauto on November 30, 2017 by Staff.